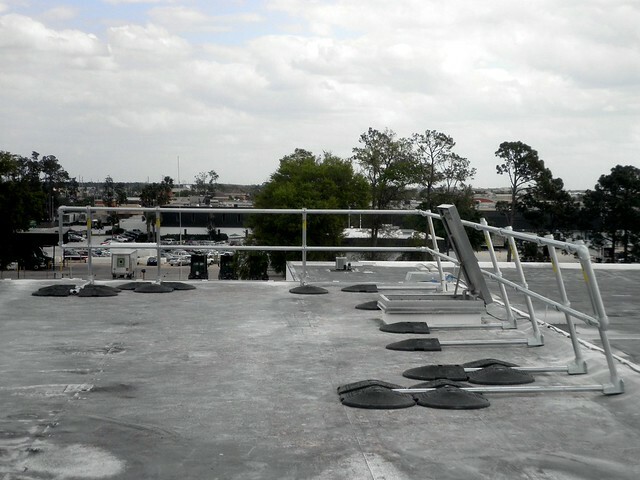 KeeGuard Rooftop Railing is "Super Easy to Install"
These photos come from a KeeGuard rooftop railing install from one of our recent customers. We were pleased to hear them comment on how easy it is to install the system. This comment focuses on one of the core strengths of the KeeGuard rooftop railing system: ease of installation. 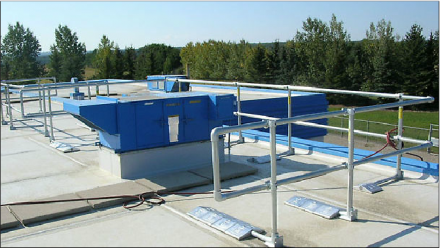 This system was put into place as a part of a complete fall protection plan. 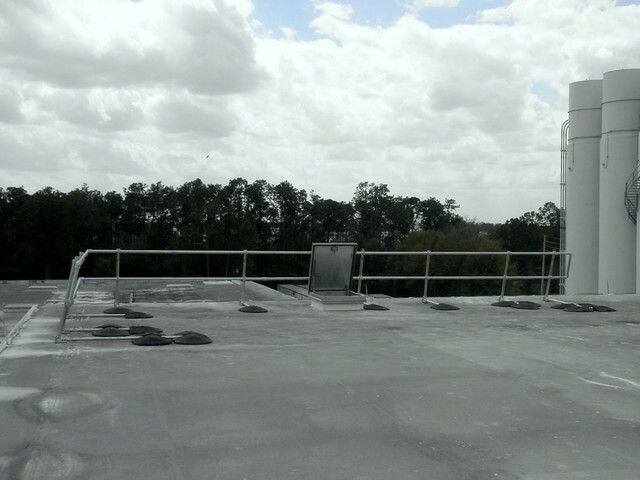 This railings primary purpose is to protect people entering exiting the roof hatch in the picutre. Uprights Arrive Preassembled - while they are not attached to the counter-balances to preserve shipping space, the drop in fittings are already properly spaced saving precious time during installation. Kee Klamp Fittings - the KeeGuard roof railing used Kee Klamp fittings. These fittings are tightened though the use of an allen key making installation move quickly and easily. Engineered for Efficiency - because each KeeGuard system is engineered by our sales team, we use a minimum amount of materials to save cost and installation time. Watch this quick overview of KeeGuard installation. 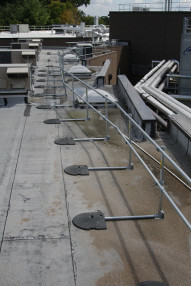 This will show you how quickly and easily the KeeGuard Rooftop Railing system is to install. 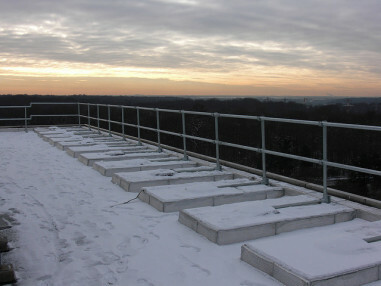 Pictured is an installation of KeeGuard Rooftop Railing in Canada. 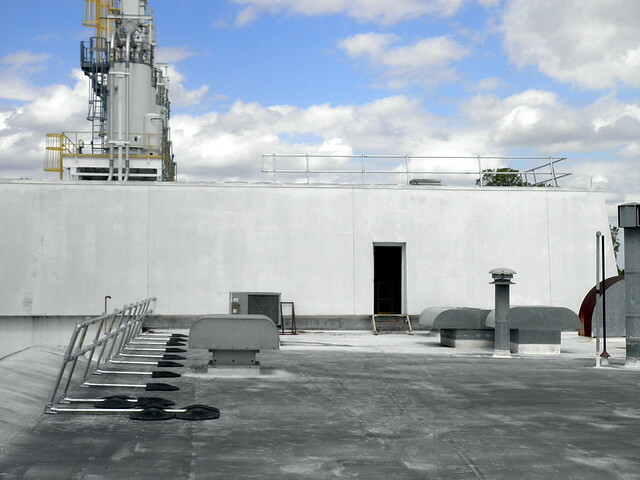 You can see how the KeeGuard fall protection system is used to protect the worker who is working on the rooftop units.